This time I worked a different spot in the valley....where the old timers left a portion of the virgin glacial material behind. 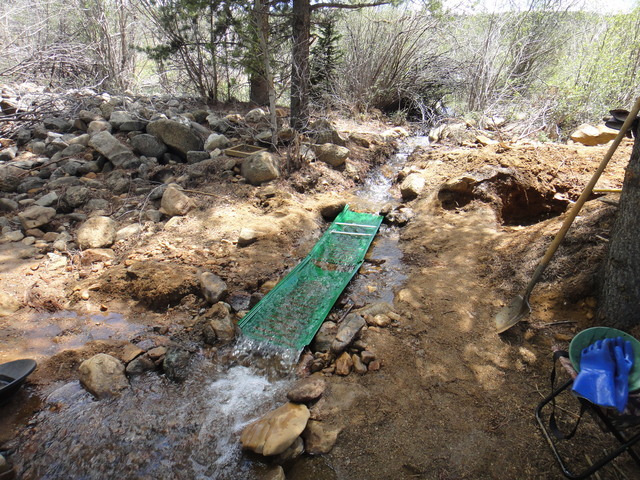 Can't work it unless we have snow melt and the water level in the valley rises and runoff starts to flow thru areas that are outside of the creek proper. My buddy Ron sluiced with me until almost noon, then he had to depart for the afternoon.....leaving me with all the gold. 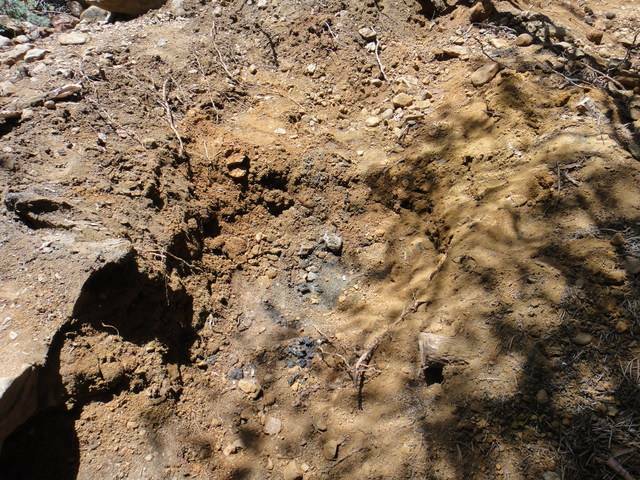 He ran a lot of pails of dirt and got some nice Cache Creek gold. I sluiced nonstop from about 7:30 AM till noon and then did a cleanup and lunch. Then sluiced from 12:15PM to 3 PM. By then I was whipped. 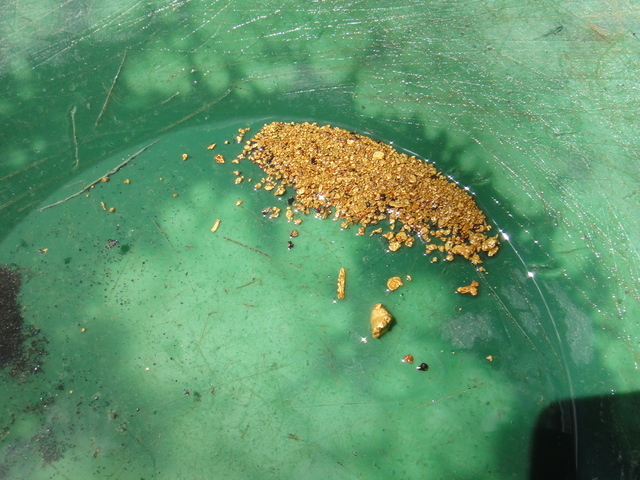 On my second run after about 20 minutes of shoveling I could see a nice, yellow chunk of gold holding perfectly still in the middle of my 2nd drop riffle. Turned out to be a nice "baby" nugget! 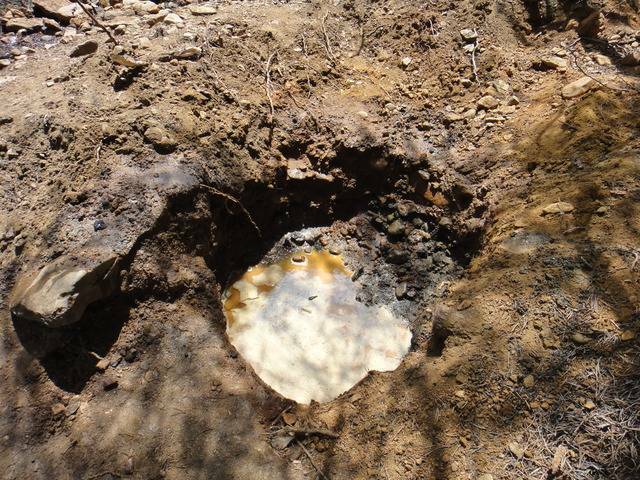 One of, if not the biggest piece of Cache Creek gold I've found. FWIW, when I cleaned up the 2nd Le Trap.......almost nothing in it! Maybe 5 or 6 small colors, that's it..............even as fast as I was running the water and as fast as I was shoveling the material... 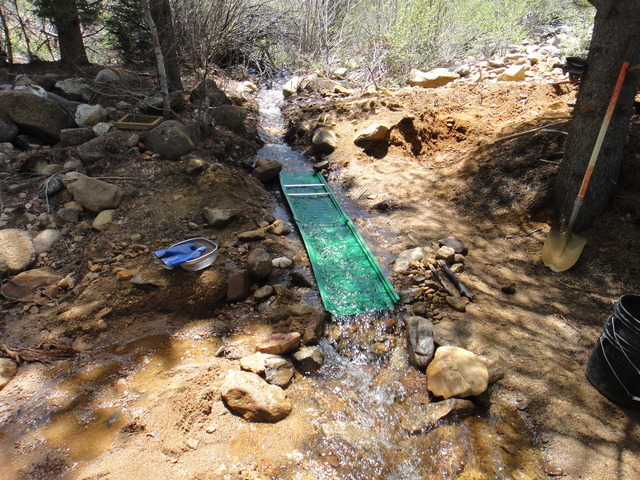 So, either the first Le Trap did about a 99% job, OR whatever gold escaped # 1 it also escaped # 2 sluice. So, makes me feel real good that just one Le Trap will get the vast majority of even the finest gold. 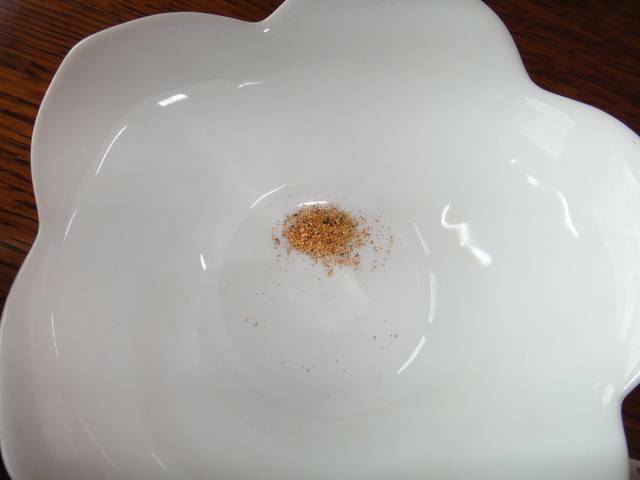 My gold take here for the day: https://www.youtube.com/watch?v=OgjBgnA5av8 Turned out to be a very nice 25.5 grains or 1.65 grams total. That "baby" nugget was a whopping 2.3 grains or .15 grams. P.S. I went back on 11 June for a half day..........ended up with 11.7 grains or .76 grams. I'll take that! 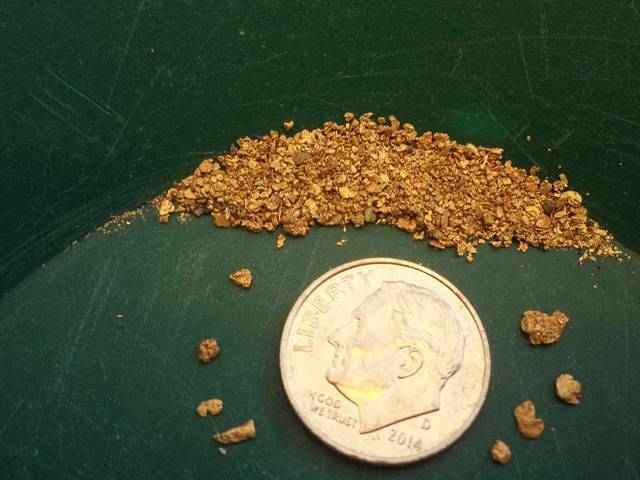 UPDATE: The Chief got all his cons from his 4 days of prospecting cleaned up and got a very nice 2.92 grams after sluicing 88 2 1/2 gal pails of material. His friend Ralph helped out a couple days too. 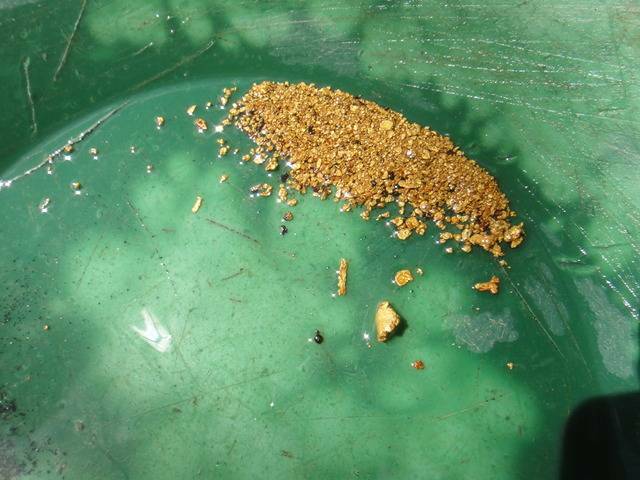 Looks like beautiful , chunky Cache Creek gold with a good number of small pickers. Well done guys! Randy I think your assuretion of 99% might be a slight exageration ! Its probly 98.98% Congrats on the nice picker!! Really nice cleanup! I kind of figured that there are many other spots at CC that hold the yellow stuff and the Police are doing their best to discourage the miners so they can close it all together. Really nice picker. Have some more "Hard Fun". Wow..... largest piece I have ever seen come out of Cache Creek!!! On my way Randy.....on my way. Well...............with all that material dug/washed, I know you'll have a nice, yellow cleanup. Can't wait to see the pics, get the final weight.....just to enjoy it with you. Man that's some good looking stuff Randy.. I'm still stuck here till this helicopter is done. Nice job buddy. Great to hear from you! Miner Matt just today was asking if I'd heard from you lately...............and I had to say, "nope". 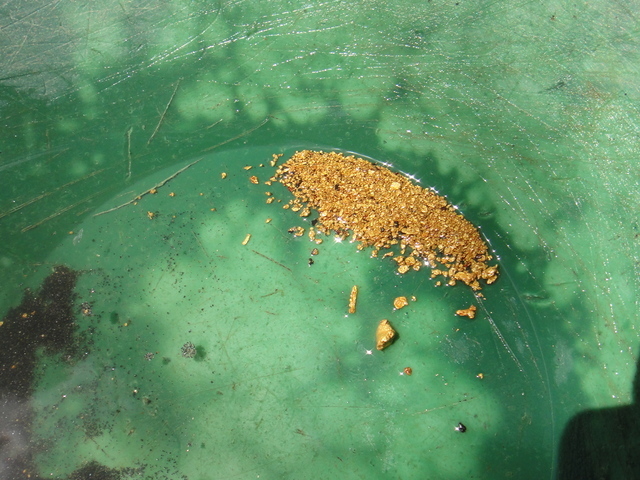 Yeah, been getting some nice Cache Creek gold lately. How long until you finish your helicopter? Maybe test fly it to that creek of yours and land and mine for a while??? Ha. Randy I hope to be finished up in four to five weeks. My big red trailer should be back next week and its already sold. I will deliver it to Texas not far from here and than go buy my new camper. I have the helicopter factory check out guy scheduled to be here the second week of July. I'm working night and day. I know I'm getting another late start but better late than never right.. Tell Matt hello and you guys keep the videos coming. Very nice looking gold, Randy. I reco'ed you to a guy on Treasure Net who was interested in Cache Creek. Hope he contacts you.